to see Mrs Smith. From there to Aunt [Eunices?]. Ida walked down town with me. I came home at 4.30. Will has too tired from having hauled sand all day to go down to Woolfs to call on their friends from [Delmar?]. Was busy all evening A fine day. 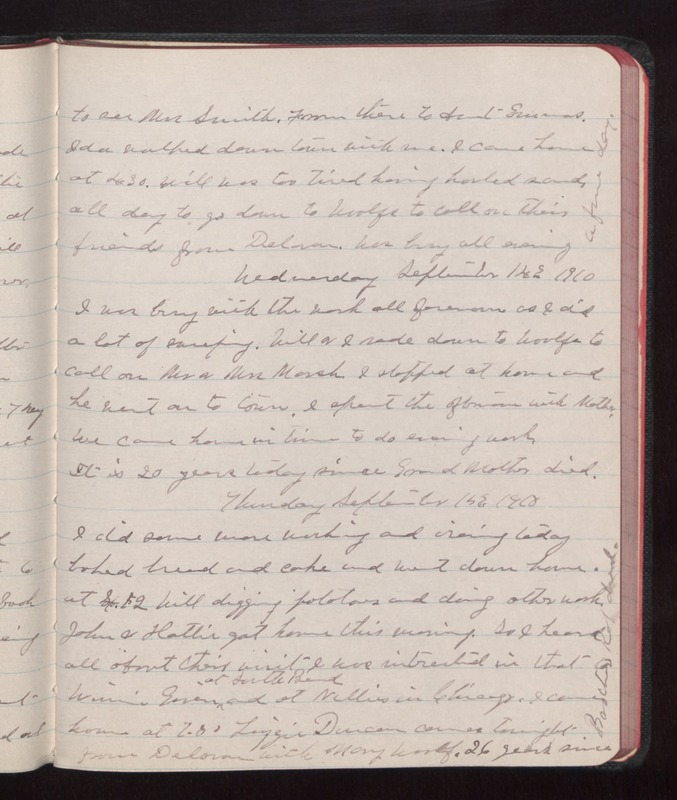 Wednesday September 14 1910 I was busy with the work all forenoon as I did a lot of [illegible]. Will & I rode down to Woolfs to call on Mr & Mrs Marsh. I stopped at home and he went on to town. I spent the afternoon with Mother. We came home in time to do evening work. It is 20 years today since Grand Mother died. Thursday September 15 1910 I did some more washing and ironing today baked bread and cake and went down home. at 4.12 Will digging potatoes and doing other work. John & Hattie got home this morning. So I heard all about their visit I was interested in that Winnie [illegible] at South Bed and at Nellies in Chicago. I came home at 7.30. Lizzie Duncan comes tonight from [Deloran?] with Mary Woolf. 26 years since Brother Rob died.